You are here : Home / How to do URL Filter in Google Maps Plugin. 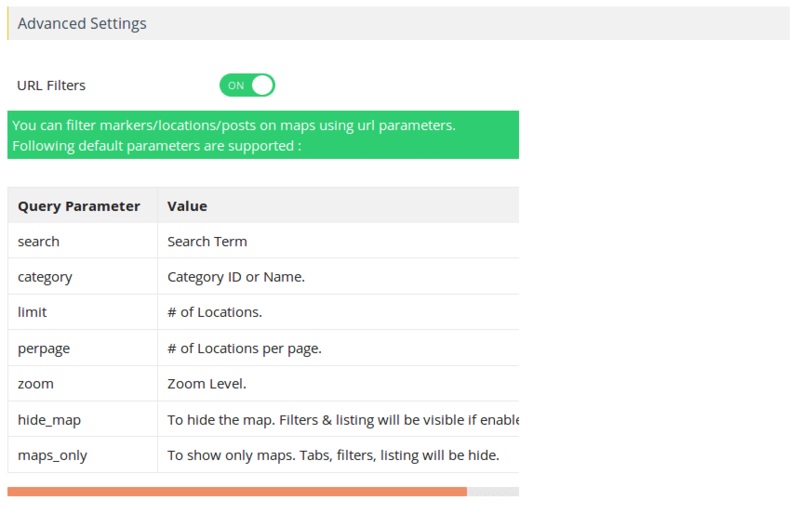 In our Advanced Google Maps WordPress plugin version 5.0, we have introduced a new feature where a user can able to filter the locations directly from the URL. Step 1 Please Go to the ‘Advanced Settings‘ and Enable ‘URL Filter’ under Add/Manage Map Menu. 2.) URL Zoom Filter: You can change the zoom of the map using a Zoom URL filter. 3.) URL Per Page Filter: Display # of Locations per page. 4.) Hide Map Filter: You can hide the map using URL Filter parameter ‘hide_map= true’. 5.) Map’s Only URL Filter: To show only maps. Tabs, filters, listing will be hide.